#stampinup #faithfulinkspirations This week, I'm going to share four cards that we made at the September Proverbial Stampers get together using the "Christmas Magic" stamp set. This set has a nostalgic feeling and the images are really sweet. First up, we have Mr. Snowman. I stamped him in Basic Black Archival Ink onto a 2" square of Whisper White. I used Real Red, Garden Green, and Pumpkin Pie Stampin' Write Markers to color the details on this little guy. I laid down a line of Multi-Purpose Liquid Glue at the base of the snowman and sprinkled on some White Mica Flakes. Gorgeous! Next, I embossed a Whisper White mat using the Softly Falling Embossing Folder. I added a strip of Gold Glimmer Paper and then a wider strip of Warmth and Cheer Designer Series Paper. Then, I adhered everything to a Garden Green card base. 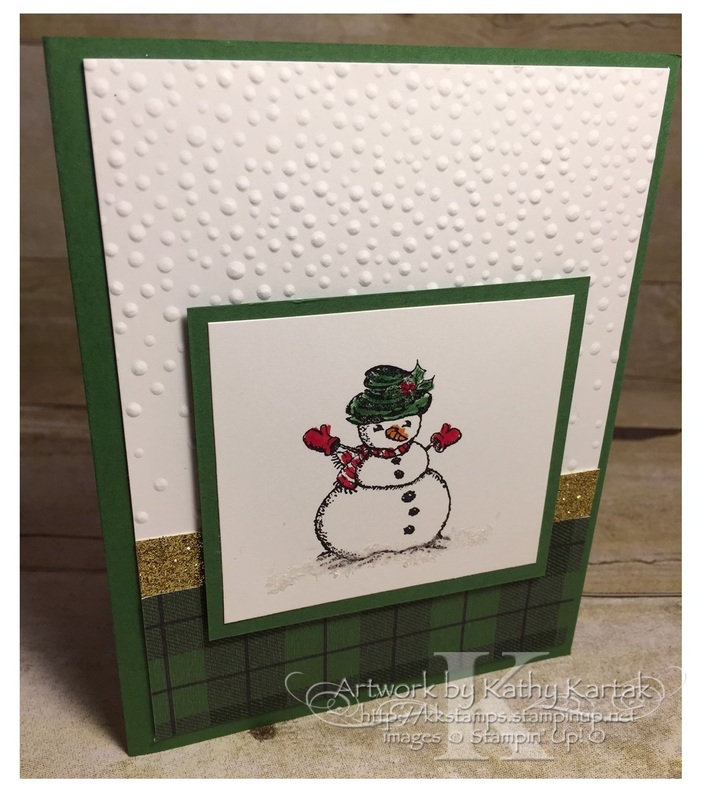 I added the snowman element to the card using Stampin' Dimensionals. Isn't he just the sweetest?